(NewsUSA) - From family gatherings to cookie exchanges, the holiday season is delicious--and can do a number on a typically balanced diet. Whether you want to curb your appetite to avoid over-indulging in tempting treats or need fuel ahead of your holiday shopping marathon, here are some smart-snacking suggestions to make this holiday season your healthiest yet. *	Happy Trail(s) Mix: To keep you energized on the go, keep homemade trail mix handy. It's a great source of vitamins, fiber and healthy fats that provides a boost of energy so you can shop without dropping. Customize it with your favorite ingredients and toss in some cranberries and pistachios for a festive touch. *	Pack in the Protein: Every family has traditional holiday recipes, and many serve as sides to the main course. Whether your family's go-to main dish is ham, turkey or even turducken, the holidays are the time to savor the foods you seldom take the time to dish up throughout the year. While you're anxiously waiting for the big meal, try subbing small portions of protein to keep your blood sugar in check. Bite-size offerings, such as meat snacks, are the perfect grab-and-go option and will rev up your metabolism, while supplying you with lasting energy. But be careful to avoid meat snacks high in sodium and sugar. 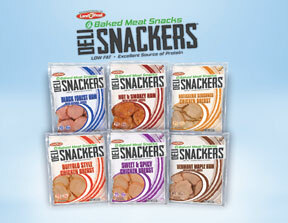 A great healthy option is Deli Snackers from Land O'Frost, a baked meat snack made from high-quality, oven-roasted meats. This convenient and flavorful choice offers more than 10 grams of nourishing protein per serving with less than 400 mg of sodium, making it the perfect treat to meet your healthy-eating goals. *	Festive Fiber: To prevent the mid-afternoon stomach grumble, use a muffin tin to make a batch of portion-controlled oatmeal cups --a healthy and delicious snack that can be enjoyed any time of the day. Oatmeal, which is high in fiber, will keep you satiated before dinner, and adding natural ingredients such as pure maple sugar and cinnamon will healthily satisfy your sweet tooth so you don't reach for a sugary pastry or any of the other filler foods overflowing from the kitchen. So why wait until New Year's Eve to start your resolutions? Get a kick-start this holiday season and try out any of these nutritious snacks without sacrificing the festivities.